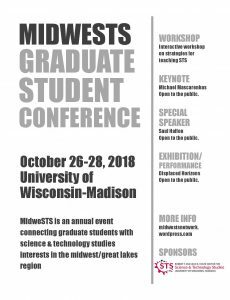 The Holtz Center will be hosting the MidweSTS Grad Student Network meeting on the weekend of October 26-28, 2018. Please visit https://midwestsnetwork.wordpress.com for up to date information and details. MidweSTS invites graduate student submissions for a 3-day workshop addressing themes in critical, decolonial, feminist, anti-racist, transnational, queer, and ecological potentials in science and technology studies, as well as critical doing/making and design studies. We invite work engaging in the politics of creation/knowledge production and political intervention, as well as scholars working in the regional in-between that gets called “Midwest,” including the Great Lakes region; lands variously territorialized by histories of settler colonialism, indigenous presence and practice, industrialism and its alternatives, black technocultures, migrant makings, and visible and invisible genealogies of innovation. It is a region that today is often positioned as a deindustrial periphery despite its lively and ongoing technoscientific and political innovations, experimentations, and solidarities. In light of ongoing contentious public debates over the appropriate role of higher education to meet the needs of the 21st century world, we especially encourage submissions that address issues relating to the future of the contemporary university as an institution that ostensibly is in service of the “public interest.” This event, which is the third annual midweSTS Graduate Workshop, will gather together exciting critical work being created in this Midwest region and aims towards building stronger networks and communities between emerging scholars and researchers. We hope that this year’s iteration of the workshop will allow scholars to critically reflect on how STS scholarship stands in relation to how higher education continues to undergo structural shifts given increasing academic precarity, not to mention, corporatization (of scientific research), anti-intellectualism as well as the broader devaluation of the qualitative social sciences and humanities. Keynote address from Michael Mascarenhas. 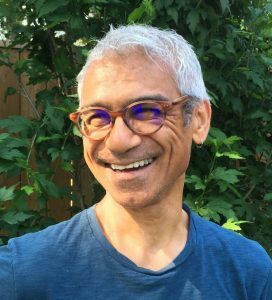 Mascarenhas’ impressive work draws together critical race theory, and environmental justice, and addresses issues ranging from the political economy of natural resources to the transformation of politics and power dynamics in humanitarian policy. Interactive workshop on strategies for teaching STS. 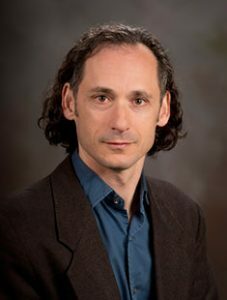 Faculty and grad students will help you build your toolkit of teaching techniques by demonstrating some of their favorite classroom exercises for illustrating STS concepts. Displaced Horizons: Exhibition/Performance. Socialize with your fellow students at this artistic exhibition and musical performance, which draws inspiration from infrastructural thought in STS to create an aesthetic and experiential reorientation towards water infrastructures’ socio-cultural and historical complexities. If you have any questions or queries, please contact the organizers at midwests2018.workshop@gmail.com and midwests.workshop@gmail.com.